Students at the University of California Santa Cruz disrupted Marine recruitment at a campus job fair on October 18. The protest was organized by Students Against War. A "queer kiss-in" protesting the military's don't-ask-don't-tell policy effectively blocked the Marines' access to the students at the fair. It was the first return of recruiters to UCSC since students kicked them off campus in April. New York Veterans Speak Out (VVAW and Veterans For Peace) is sponsoring a youth contest based on rhymes written by high school students in the theme of the American Friends Service Committee (AFSC) flyer... "10 Things You Need To Know Before You Talk To A Recruiter". The student with the best rhyme wins $500. Visit Veterans Speak Out for more info. 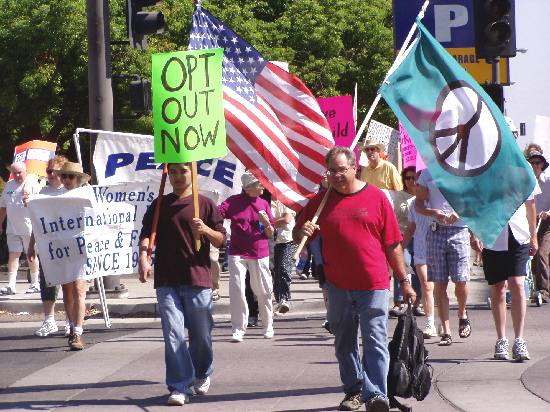 A march and rally of around 50 was held in downtown Fresno today (September 10, 2005) to encourage students to "opt-out" of being contacted by military recruiters. Organizers for the march said that under The No Child Left Behind Act public schools are obligated to furnish the contact information of students to the federal government for use by military recruiters. At the rally in front of the Navy recruiting center, participants were told that many students and parents may not know they have the legal option of opting out by signing a form requesting that the school administration not supply their personal contact information for military recruitment purposes. Schools are not financially penalized for informing students and parents that they have the right to opt out from being contacted by military recruiters. Pictures and full report here. For the third time in recent weeks students protesters at Bronx Community College drove military recruiters off campus. Targeted so far have been recruiters from the Army, Air Force National Guard, and most recently -- on Wednesday -- the Marines. Here is a report w/ photos from one of the earlier anti-recruiter actions in the Bronx. The protests appear to be largely organized by a group called The Revolutionary Reconstruction Club. From Santa Cruz Indymedia: On April 5, about 300 UC Santa Cruz students led by Students Against War (SAW) kicked Army, Navy and Marine Corps recruiters out of the annual Career Center Job Fair, marking yet another success for the nation-wide counter-military recruitment campaign. (Call to Action!)... As the march began, a small group of students infiltrated the Job Fair and surrounded recruiter’s tables, chanting and linking arms. This small group was soon joined by more students from the march who pushed their way through front and side doors, chanting, “Whose Campus? Our Campus!” as Job Fair administrations attempted to literally shove them out the door. Ultimately, 100 students were able to surround recruiters’ tables while the remaining 200 marchers stayed outside the Event Center, blocking the entrances and chanting in support of those on the inside. On Thursday the Central Intelligence Agency cancelled a planned event at New York University after activists with the Campus Antiwar Network announced plans to stage a protest. The CIA is involved in a little-known marketing program at NYU and the University of Texas-Pan American (UTPA). The Agency is funding a program where business students develop a marketing plan to help improve the CIA's success in on-campus recruiting. On this pilot project, the CIA is also working the private marketing company EdVenture Partners which has previously worked with the National Security Agency and State Department. "The Collegiate Marketing Program is designed to give students hands-on training about the fundamentals of marketing," reported the Pan American, the student newspaper at the University of Texas. "The idea is that students recruit students for the CIA." In Texas, the program generated controversy because the marketing students had asked professors -- primarily in the departments of Middle Eastern studies and Asian studies -- to use class time to survey students about their attitudes toward the CIA. In a recent report, the Austin Chronicle pointed out that the EdVenture Partners' Web site makes it clear that education is not its only goal: "Students receive an unparalleled educational experience they will put in their resumes, and you leave with what every marketer dreams of ... Results – developed by the target audience for the target audience." Students at both schools have protested the CIA project. "This CIA recruitment in the guise of a class represents a campaign of sorts on the part of the government to pull as many as they can into the military machine." said Sam Pipp, a sophomore at NYU and member of the Campus Antiwar Network. Fellow CAN member, Elizabeth Wrigley-Field, added "We believe they're testing the waters to see how brazenly they can recruit on campuses without encountering student opposition, before spreading programs like this to colleges across the country." That schools educate students about the threat of the draft. That military recruiters be kept out of our schools. That JROTC programs be cancelled and replaced with real electives and after school programs for youth in this city. That all parents be notified of their right to prohibit their child's information from being submitted to military recruiters under the No Child Left Behind Act. Boston: Antidraft activists, trade unionists, and youth organizers rallied in front of the military recruiting station in downtown Boston. They were joined by students who walked out of class and Carl Webb, a member of the Army National Guard who has refused to deploy to Iraq. Worcester, MA: 60 Methacton High School students walked out of class voicing their opposition to the war and a potential draft reinstatement. Bloomington, IN: More than 50 people turned for a spirited protest against the draft and military recruiting at newly-opened office of the Indiana National Guard. Raleigh, NC: Activists picketed in front of the Army Recruiting Station and blocked the entrance for the duration of their protest.